The thrilling sequel to POSSESSED! Rayne's countryside escape has proven to be anything but -- the remote mansion house where she lives and works holds terrible secrets, and she feels trapped there. And when a new manager shows up, things take an even more sinister turn. Rayne doesn't know who to trust -- even the ghosts of Morton's Keep seem to be warning her. It's up to Rayne to overcome the ancient evil lurking here -- but how? Rayne returns in Consumed tackling an even bigger problem than before in the Keep. Yes, bigger. I enjoyed this book just as much as Possessed. I love the mystery, paranormal and haunted-ness of it all. As all of you know by now from my love affair with Karina Halle's Experiments in Terror Series, I love stories about hauntings. There is also something about these books that remind me of the Nancy Drew books, which I know sound crazy, but the way the mystery unfolds bring me back to when I was in elementary school, pretending to be asleep, but really reading the latest Nancy Drew book I had received (and then of course having trouble sleeping afterwards). And this time around, the evil is 100% known about so it's all about the human element trying to get at it, and somehow I found myself surprised and turned around again. I enjoy Rayne as a character, she reacts to things realistically as one possibly can in the situations she's put in. She is not ready for another relationship right away which I love (seriously, who would be after St. John? ), and she does not just accept the paranormal things and go with it, she runs. She also is very distrusting which is incredibly reasonable considering what happened in Possessed. One thing I really liked was when Rayne went backed to London and saw that she really did not belong anymore. I know this feeling so well having come back from graduating college. There's a disconnect, she's grown past everyone and knows so much more and is on a whole different level than them. For her the country is a place where she can be herself and relax, while to her friends and family is boring and stupid. It's amazing when you compare her in this book to who she was in the beginning of the last book. She acts like an adult now. The other thing I loved was the epic climax between Skelton's group and the village. It also really showed the fire dancing in the beginning as a great foreshadowing to this climax to come. Just how big it was, I couldn't stop reading and I was honestly afraid that they weren't going to make it, and how that might have made way for a third book, but was I was glad when it all worked out, and I adore the idea of the green lady and how the people of the village came to arms about it all. Also just going to mention I was SO creeped out by the dancer ghosts that returned that signaled to Rayne everything was not good at all. We need more horror YA in the marketplace, darnnit. 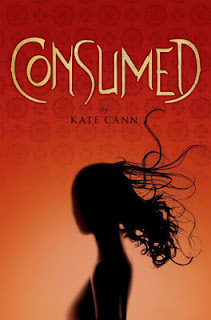 I know it was popular a couple of decades ago, but with all the romantic paranormal there are barely any good pieces being put out at all, Consumed however is one of them, and I really would recommend this book to anyone who loves horror and who loves the thought of fighting great evil.